Novatak Glacier and a large unnamed south-flowing glacier to the east, here designated as East Novatak Glacier, were connected when first mapped by the International Border Commission in the 1906-08 period. 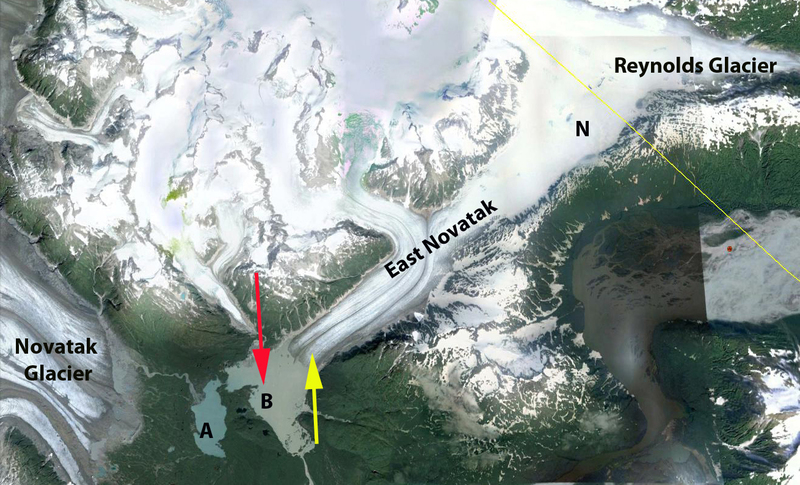 By the 1950’s maps indicated the Novatak and East Novatak Glacier have separated, with a lake (A) developing between them. Here we examined 1984-2013 Landsat images to determined changes over the last 30 years. 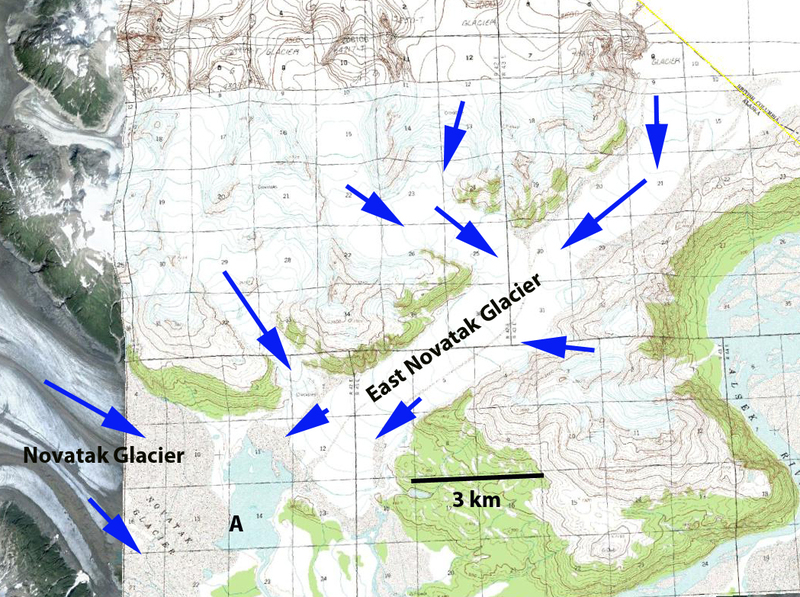 Map of East Novatak Glacier area. East Novatak Glacier ended in a lake (B) in 1984, this lake then drained a short distance south to the Alsek River. The glacier was separated from the main Novatak Glacier by 3.5 km. 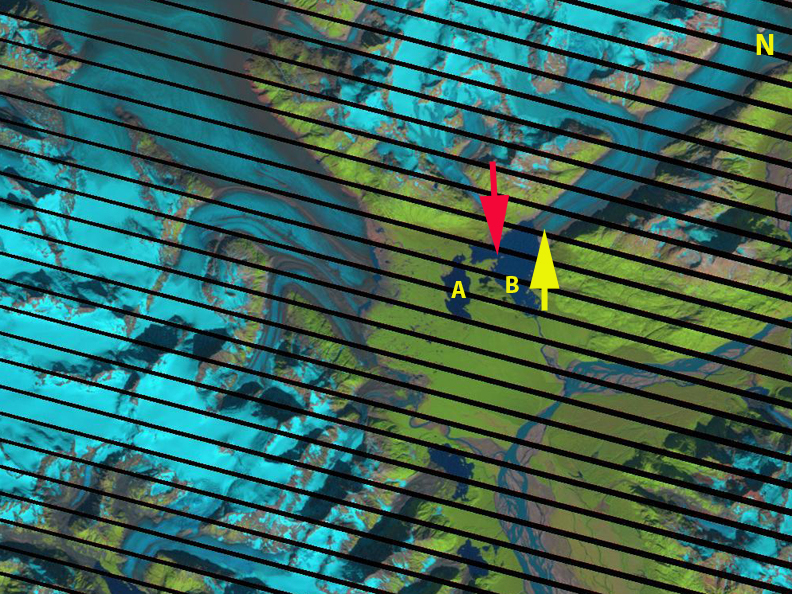 In each image the 1984 terminus is marked by red arrow and 2013 image by yellow arrow, N marks the location of a nunatak that develops after 1984. In 1987 glacier retreat has connected the northern and southern half of B Lake. Lake A is still getting glacier runoff leading to a lighter blue color. By 2010 A Lake is no longer getting much glacier runoff and the water color is much darker than B Lake. A nunatak has emerged as well due to thinning ice. East Novatak Glacier has retreated out of the lake basin on the low lying plain, and into the mountain valley. In 2013 the terminus has narrowed and has retreated 2.5 to 3 km since 1984. 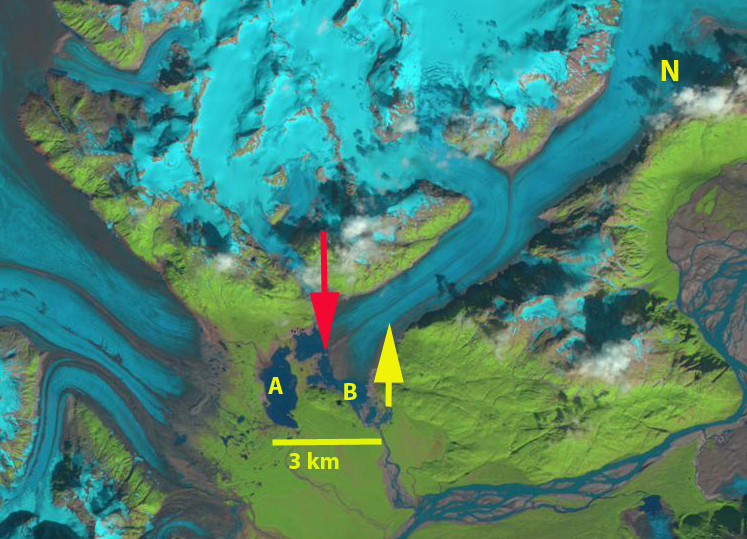 The glacier is now separated from the retreating Novatak Glacier by 6 km. 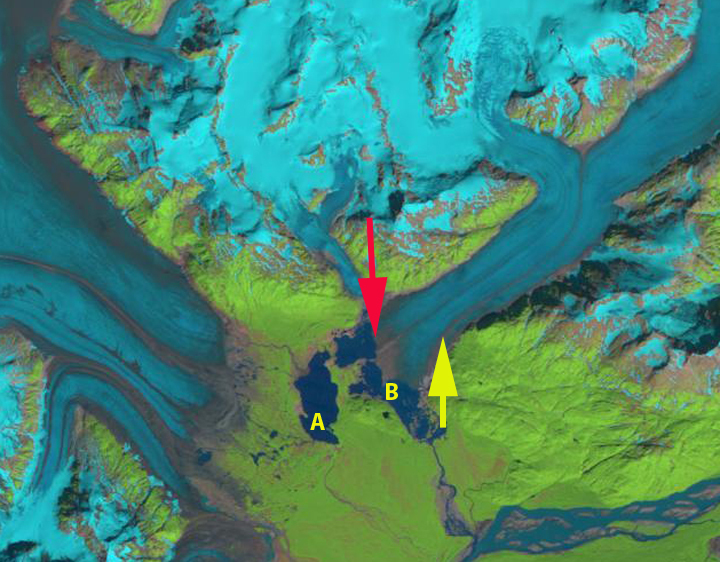 The tributary that used to connect to the main glacier and is partly obscured by the red arrow, now ends well short of the East Novatak Glacier. Most of the East Novatak Glacier is below 1000 m in elevation, which has been the recent snowline elevation. 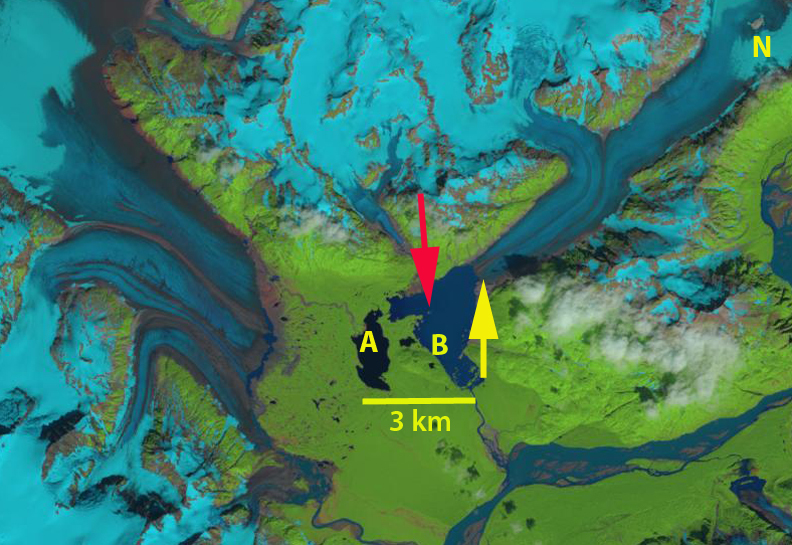 The retreat of this glacier like that of nearby Yakutat Glacier, indicates how suscpetible the Alaskan glaciers in the region with lower elevation accumulation zones are to our warming climate (Truessel et al, 2013). The retreat is similar to Grand Plateau Glacier, but that glacier does have high elevation accumulation areas, that will allow that glacier to survive. This entry was posted in Glacier Observations and tagged alaska glacier retreat, alsek river glacier retreat, East Novatak glacier retreat. Bookmark the permalink.